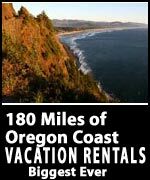 (Oregon Coast) – It’s one of the most engaging places in the United States, so much so it’s a hot subject of travel writers all over the country these days. 362 miles of it meander along the ocean, between Astoria and Brookings. The Oregon coast is a rugged, wild and sometimes weird and surreal place, full of interesting dichotomies. One minute, the surf is raging in front of you, along a craggy rock shoreline or a vast beach where nary a soul can be seen. Take a few steps back towards the land, and you may find somebody’s gargantuan piece of oceanfront real estate glaring at you or a scrumptious upscale restaurant. Civilization is, at times, a few feet away from the lonely beaches. Other times, it’s a good mile or two drive away. There are enormous cliffs and sea stacks that dot the shores, soaring high above it all, or long strands of soft sand and fluffy beach dunes. There are tons of rocky blobs creating labyrinths of ancient basalt on some beaches, often creating places where the tide pools far outnumber the human beings. In other places, enormous rock structures and headlands create exploration possibilities that make you forget that you aren’t Lewis and Clark after all. 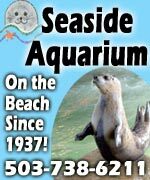 This photographic tour features links to hundreds of photos and begins south, in the middle of the Oregon coast, near Florence. It then progresses northward. 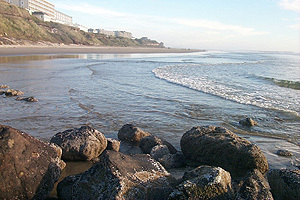 There are thousands of Oregon coast pictures in this website, with many spotlighted in the Virtual Tours. There are links all over this page to this vast gallery of pictures and photos. Just north of Florence, this beauty is known as the world’s most photographed lighthouse, and for good reason. This stately beauty is visible some 21 months out to sea and has been around since the 1890’s. Its giant light was just replaced in 2000. 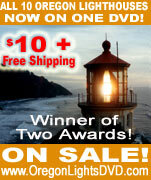 During the summer months, you can get tours of the lighthouse. When it’s windy, you can feel the building creek and bend just a little as you tread that old, metallic circular staircase. There are trails wandering up behind the lighthouse as well, which make for great photographs. The old lighthouse keeper’s quarters is now a bed & breakfast and is said to be haunted. 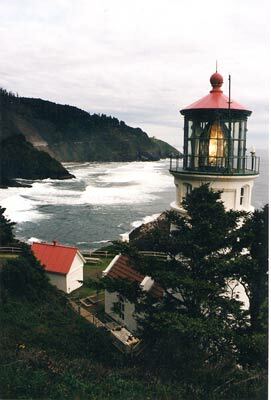 One of the more spectacular annual events surrounding the lighthouse happens in December with the caroling, lights and the open house at the Heceta Head Lighthouse Keeper's Inn. There's a sing-a-long procession after dark up to the lighthouse that is nothing short of ethereal. 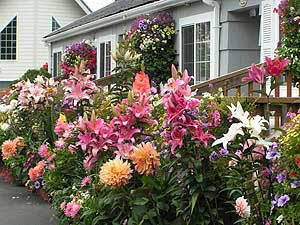 Yachats is definitely one of Oregon's more stunning scenic vistas, and one heck of a charmer of a village. Upscale, intriguing, restaurants populate this place in great abundance, as well as some interesting lodging. It has an unusual character for any place on Oregon's coast, managing to be rugged and untamed in many ways yet still exude an unparallel sense of class. 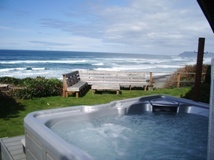 It’s no secret that it’s called the ``Gem of the Oregon Coast.’’ But Yachats has its secrets. There's more to this engaging area than meets the eye - even the eyes of many regulars. You need only spend a little more time poking around and you’ll find a variety of interesting to oddball stuff: beach-oriented goodies that go well beyond Yachats’ already steady supply of craggy, rock-filled beaches, amazing eateries and intriguing accommodations. Check out its funky buildings, often with a new age flavor to them, or the beautiful, atmospheric and historical examples such as the log cabins of the Shamrock Lodgettes. 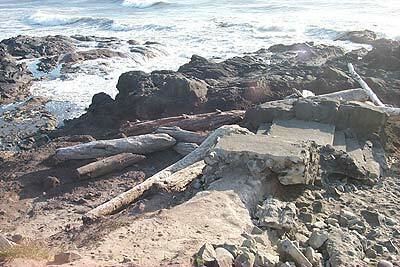 There are some structures in the Yachats area which have maritime themes in rather unusual ways as well. 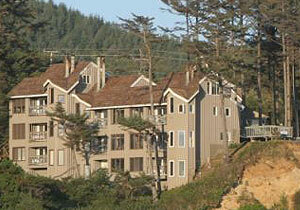 The Yachats Inn was constructed to look like a ship from a distance, when viewed from the hills above the town. This tiny village knows how to live it up. Every Fourth of July it cuts lose with the La De Da Days. There’s also a major classical music festival during the summer, a month-long Christmas celebration and the scrumptious Mushroom Festival every fall. The town has an interesting past as well. Some of that started thousands of years ago. There are some spots just south of the town where ancient Indian middens have been discovered. These are piles of shells and other "rubbish" tossed away by local tribes who lived here over various millennia. Archeologists are having a field day with this stuff and learning much from it. The locations of these are secret, however, to avoid being disturbed and ruined. There’s maybe a quarter mile of a town here, but it contains a couple of treasures. Check out the yum-o-rama Japanese cuisine of Yuzen. 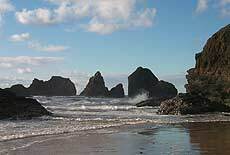 And the kids will love bouncing around the beach or the craggy, complex rock structures of Seal Rock State Park. Seal Rock began its days as a budding resort town back in the last century, but various failed deals and a railroad line from the valley that never happened resulted in this tiny town surrounded by wondrous, unspoiled natural attractions. It's part touristy, part party town, a slightly upscale resort, a sometimes surreal bit of small town Americana and a treasure trove all in one, filled with an enormous array of natural delights and stunning beauty. It's easy to get lost in the crowds and the tourist spots, but it's not too difficult to find solace on a deserted section of beach or pier somewhere. Newport is rich in history, and it continues to be committed to keeping its past alive as it constantly expands and changes with modern times. There are restaurants and attractions for every budget and taste, and an often-freakish nightlife that may leave you laughing until you cry. It's an unusual combination of manmade and natural recreation and of varied, even contradictory means of repose. This lovely little village curiously straddles the roles of natural wonder and strip mall, while still managing to ooze a strong sense of serenity and beauty. Whatever civilization takes away here nature more than makes up for it in fun and scenery. Along the highway, countless shopping and eating opportunities populate the landward side, while the seaward side makes for some amazing discoveries. Numerous curio shops, art galleries, wine tasting in a “cave” and scrumptious eateries create a touristy vibe to this otherwise virginal sampling of coastline, but you can often find oddities and pleasantries you can't purchase anywhere else. Whale watching tours abound along this street, as well as fishing charters. An annual highpoint in Depoe Bay is the Indian-style Salmon Bake, held every September. Salmon is cooked not just the old-fashioned way – but the really ancient way: in the manner of local tribes. They carved out a pit for the fire, then leaned sticks up against each other and barbecued the fish that way. 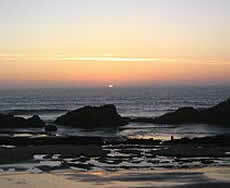 It's at the north end of Lincoln City where the real surprises often lie. Land's End Road will lead you to Land's End State Park, and from there you can continue north through a neighborhood of cabins and expensive homes until you come to the last public beach access. This spot allows for perhaps two cars to park there and is approximately half a mile from the looming cliff. This is an intriguing mixture of a clandestine beach spot, a rock climber's paradise and a playground of endless sand. On Highway 101, between MP 94 and Oretown, Winema Road sits inconspicuously on the west side. Once there, you’ll find all sorts of oddities in the cliffs – most notably the giant rock structure plopped in the middle of the tideline. It too is perfect for climbing, with a tiny patch of grass welcoming you at its top. Head another mile or so north along this beach and you’ll reach some very secretive areas of the Nestucca Bay. About nine miles west of Tillamook, the beaches here are often shielded from the wind by the headland called Maxwell Point - about 100 yards north of the parking lot - looming above like a tall, dark, watchful god (which also boasts a noteworthy cliff top motel). To the south, it's about three miles of sandy beach leading straight to Netarts Bay, with not much else other than rocks, boulders and driftwood piled up next to the vegetation line. About a mile down, you'll find some minor trails meandering through the brush underneath the Three Capes residential development, and if you're lucky, oddly colored slabs of rock become visible if the tide is low enough. The real fun of Oceanside's beach lies inside Maxwell Point, however. The concrete tunnel here is a gateway to a stunning, secret world. Entrance into the tunnel is somewhat unadvisable recently, because of falling rocks from the cliffs. If you’re coming from the south, two salient features of this tiny town become quickly apparent. The gigantic “G” resting high on a hill above the town conjures the letters spelling “Hollywood” above Tinsel Town – but it makes you wonder if they simply ran out of room or money for the rest of the letters. If you’re coming from the north, the G isn’t visible until you get into town. It is sometimes lit up at night. And shortly after the 9/11 attacks, Garibaldi residents showed their patriotism by lighting it up with red, white and blue lights. The other unmistakable attribute of Garibaldi is the giant smokestack, which immediately pops into view from either direction. This remnant of an old paper mill is roped off to the public. But it’s so big there’s actually a tree growing on its inside. The gargantuan black tower looms over Lumbermen’s Park as well. It’s very close to MP 56. There's nothing like standing on this beach and having to strain your neck to look up at mysterious, ethereal Neahkahnie Mountain looming above you. The most obvious beach accesses lie past its downtown and at the bottom of the main road, Laneda Rd. 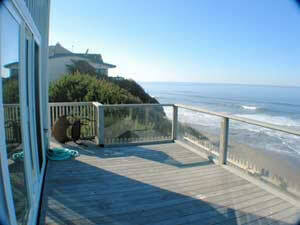 But there are numerous hidden ones south of there, between the homes, along the beachside roads. These eventually dead-end at a back entrance to Nehalem Bay State Park. In this tiny town that's full of culinary pleasures, wondrous new objects can pop up on the beach at sufficient minus tides. Depending on the amount of sand lying around that time of year, different rock objects appear on an otherwise smooth, barren beach. 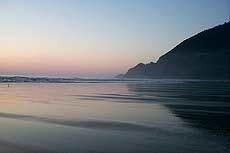 There’s also some magical things to be found in Manzanita, such as the esoteric legend of the mystical “Wheeler Moment,” named after the small town nearby. The story goes this whole Nehalem Bay area is a bit like that strange island on the “Lost” TV series, where odd things just seem to happen, unspoken wishes seem to get granted, and there’s a startling regularity of serendipity. This charmer of a town is home to many artists on the coast, and it’s purported a few national celebrities have cabins here as well. This artiness shows, partially in the city council’s rule that most buildings be dressed up in cedar shingles, giving the whole town a sense of the rustic yet refined. This artiness also shows in the abundance of quaint businesses around town, from whimsical shops selling kites, clothes and gifts, to its galleries, fine cuisine in a variety of price ranges and the many flower pots hanging everywhere. 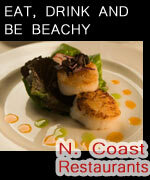 Some of the restaurants and bars even have outdoor seating – a daring, if not very urban-thinking move on the coast. Sure, it’s touristy in some ways and certainly packed with people most of the time. But there’s a coziness and beauty to this place that’s hard to forget. There are annual festivals during the year that shouldn’t be missed, including various kite festivals in summer, the Haystack arts program and the grand sand sculpturing contest every June. In November, Cannon Beach goes bonkers with the Stormy Weather Arts Festival, where galleries, artists and musicians flood the town all weekend. 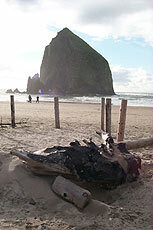 The famed Haystack Rock here has the honor of being the third largest sea monolith in the world. With its beautiful promenade (built in the 20s), a long stretch of wind-sheltered beach, its charming streets, its somewhat gaudy carnival atmosphere and a lengthy history of being one heck of a party town, Seaside has something for just about anyone. Seaside is notorious for kicking into high gear around Spring Break, so be prepared for massive crowds of collegiates and high schoolers. Summer, too, brings at least as many young folks as it does families, giving the town an interesting dose of youthful madness. 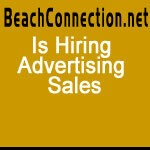 In August, as everyone heads to the beach for a last minute vacation, even weekdays acquire a buzzing, crowded state, and late at night, the beach is often dotted with bonfires surrounded by partying kids and young adults until dawn. There’s much more to this town, however. The secret beaches at the extreme southern and northern ends provide a myriad of hidden delights few places on the Oregon coast can match. The northern end has more unbroken sand dollars than you’ll find anywhere. Natural and native people’s history comes alive at the jaw-dropping Gateway to Discovery. The hiking possibilities around here are incredible. Several streets in this village end beach accesses. If you’re driving the back roads between it and Seaside, it’s often hard to tell you’re in another town. It looks much like a suburb of Seaside in many ways. 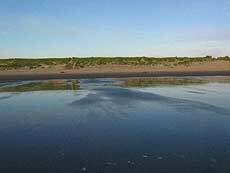 From here northward to Warrenton – just shy of Fort Stevens State Park – are beach accesses where driving your car on the beach is legal. Camping on the beach is not, however, partially for the obvious reasons involving cars and people lying around sleeping. These drivable beaches go on for about ten miles. Astoria is one big crazy surprise after another. It’s not the beach, per se, but it doesn’t have to be to wow you. Its rustic charm will mow you over as you enter from the south, as you cruise north on Marine Drive and suddenly find yourself surrounded by a massive cluster of stately and yet sometimes shaky-looking homes that look lost in this century (but happily so). But there’s more to the area than Astoria. At this, the very Northwestern end of Oregon, the state gracefully spills into the Pacific Ocean and the Columbia River via the grand but weathered charm of Astoria and its stately Victorian architecture. It's in this area where Lewis and Clark spent over 110 long, wet days; where the world's most photographed shipwreck lies; and it's one of only two places in the continental United States that were fired upon by a foreign power before the Sept. 11 terrorist attacks. It's a mixture of an old Scandinavian fishing village, a fascinating historical reminder of our country's military might and where America's British roots are still evident. With steep hills, an abundance of Victorian homes and a long-standing maritime tradition - all situated where the Columbia River meets the Pacific Ocean - Astoria has a vibe somewhere between San Francisco and Portland back in the sixties. It’s a town where being shanghaied was a major worry once, way back in the 19th century. It’s a place that the British and the Americans fought over for a brief period. 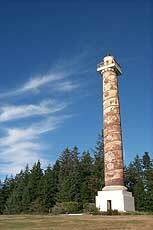 It was also the first town in Oregon, and the first city established west of the Mississippi. And it’s where the past seems to imperceptively smack into the present, blending in a way that makes the thick, oozing sense of history here indistinguishable from the modern aspects of the town. And it’s a curious mix of hipness and history, somehow achieving both in some spots. As you cruise these tight, almost claustrophobic streets filled with bulging Victorian mansions, it’s often not hard to imagine you’re wandering back in time somehow - and it's easy to forget what century you’re in.